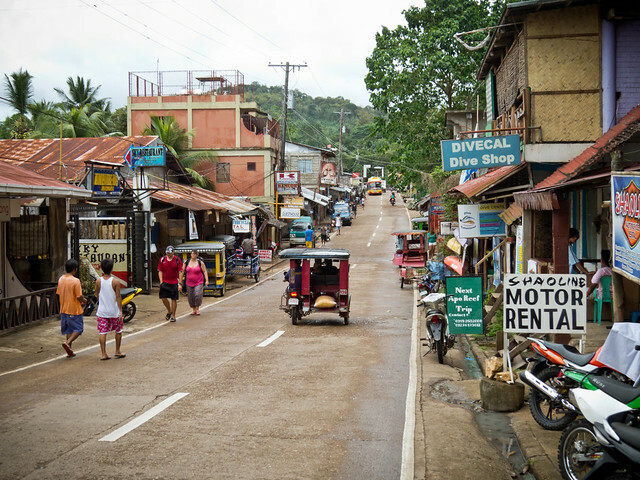 From the airport to Coron Town it was a pleasant ride with grass fields giving way to lush forests of mango trees and coconut palms spreading out from the winding road up into the hills in each direction around us. After checking in to our pleasant little bamboo guesthouse over the water, we immediately headed to our chosen dive shop to check out the following day’s schedule. The manager happily greeted us, but quickly turned our attention to his computer and the projected path of a typhoon that was headed directly towards us: Haiyan. It was the first we had heard of the storm, but there did not yet seem to be much cause for alarm. The newscasters predicted that this “super typhoon,” with sustained winds predicted to exceed 200mph, would weaken from a Category 5 to a Category 1 by the time it reached us. There was even a chance it would spin off on a completely different trajectory. Still, as a precautionary measure the boats were all heading off to a more sheltered harbor – diving would simply have to be postponed until the storm passed. We headed back through the town, more observant this time of the activity around us. Other than a few prudent locals sawing away at some precarious branches, nothing else seemed to give any indication that a potentially catastrophic storm was just two days away. Though it was easy to feel relaxed based on the actions of the townspeople, we began to make some personal efforts to prepare. We stocked up on bottled water, easily prepared foods, and cash from the ATM. In addition, the guesthouse we’d originally selected had quickly gone from charming and unique to a dangerous liability. During our first (and only) night sleeping directly over the water we literally watched the tide rise and fall by peering down between the wood slats on the floor. So, the following night we retreated to solid ground in the much more modern and sturdy apartment above our dive shop. Though twice the price, our safety was well worth it. Settled into our new place we waited for the first signs of Haiyan on the day of the storm. Around 8:30pm the typhoon finally arrived. The winds picked up and the rain began to come down hard. From inside our safe shelter it didn’t appear so bad at first – only slightly stronger than a big thunderstorm. Also, there was no storm surge as far as we could tell, which was a good thing considering the entire town is concentrated within blocks of the sea. Before long, it was quiet again. We were in the eye. The town was without power at this point, but we were fortunate enough to have a generator. Surprisingly, we still had internet – so we sent out an update to our friends and families that everything was still fine. Good thing too, as it would be our last chance to do so for a almost a week. The storm picked up again after about a half hour, this time far more intensely. The winds howled. We heard screeching sounds of metal roofs being ripped from their structures. Tree branches and debris began slamming into our building. Cell service and internet finally went down. From the innermost room of our sturdy apartment we heard the disturbing sounds continue for a full hour. Once the worst of the storm had passed cries for help replaced the shrieking sounds of the storm. The dive shop staff went outside to investigate, revealing several local families who had lost their homes and needed shelter. Around 30 people in total, many of which were children and babies, were evacuated to our building, providing shelter from the drizzling rains that continued throughout the night. With the winds dying down, we all finally laid down and attempted a few hours of rest. It wasn’t until sunrise the following morning that we were able to assess the damage. As we looked out the windows and doors we were shocked at how utterly different the scene was in comparison to the day prior. The 300-mile wide typhoon had completely swallowed the 40-mile long island and unfortunately, hadn’t lessoned in intensity as much as had been predicted. Where houses had once stood were now piles of tree branches and scraps of metal. 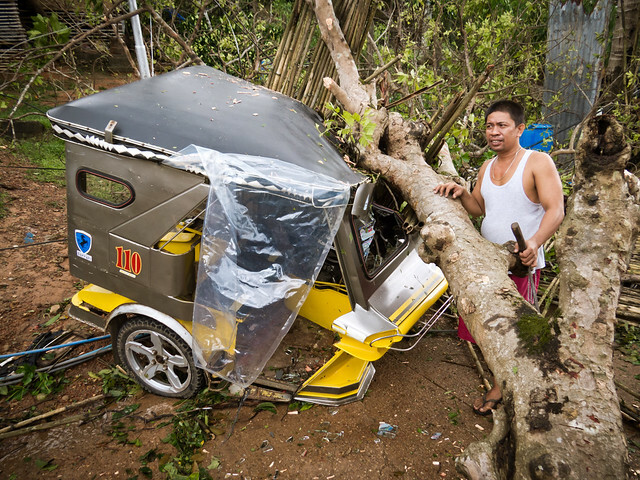 Massive mango and palm trees completely demolished many homes, businesses and vehicles. Every few feet in each direction there was another enormous downed tree; they laid across roads and walkways making it completely impossible to even leave our block. 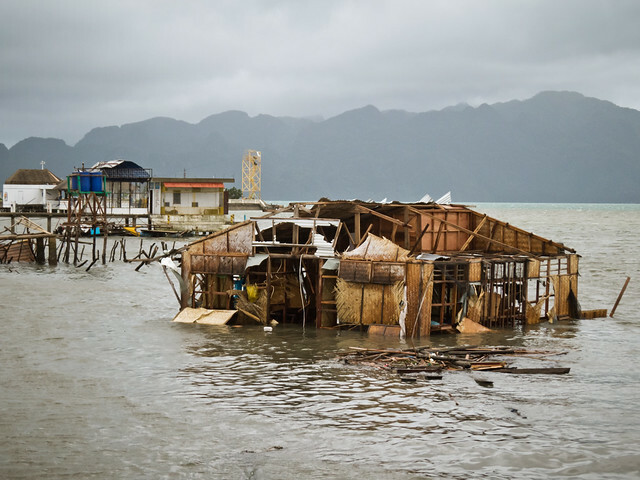 Many of the stilted homes and businesses were swallowed by the ocean with just the tips of their bamboo roofs jutting out of the water. Other buildings appeared to be lost at sea, floating on their own. The fruit and vegetable market was left in tatters with produce, wood and tarps scattered in all directions. The winds tore down communication towers and power lines. They ripped roofs from homes. Leaves were not only torn from trees but were shattered into tiny shards left to cover every surface still standing. Miles and miles of trees on this mostly forested island laid in utter disrepair, snapped in half or left as mere trunks with splintered branches. Super typhoon Haiyan had torn this once natural beauty of an island into pieces. As we examined and documented the damage the locals were already bustling to clean up the disaster. Though they had never experienced a storm of such magnitude they are all too familiar with yearly natural disasters causing harm to their homes and towns. 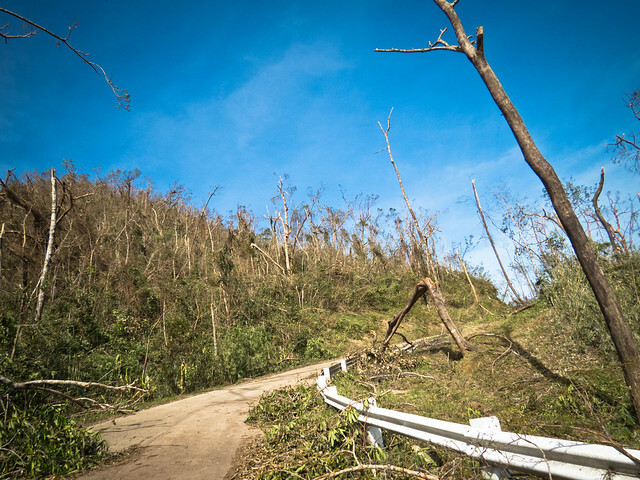 We marveled at just how fast the clean-up was progressing, even in just the first two days after the typhoon passed by. The sounds of hammers and chainsaws were everywhere. Smoke filled the town’s air as huge piles of branches were disposed of with fire. Roads were cleared just enough so that at least one lane was free. All in all, we were shocked at how industrious and hard working the entire town was and all without a single tear shed. That’s right: we never saw a single man, woman or child crying over their lost home or belongings. These people are strong, both physically and emotionally. We have not yet read of a confirmed death total for the island of Busuanga. 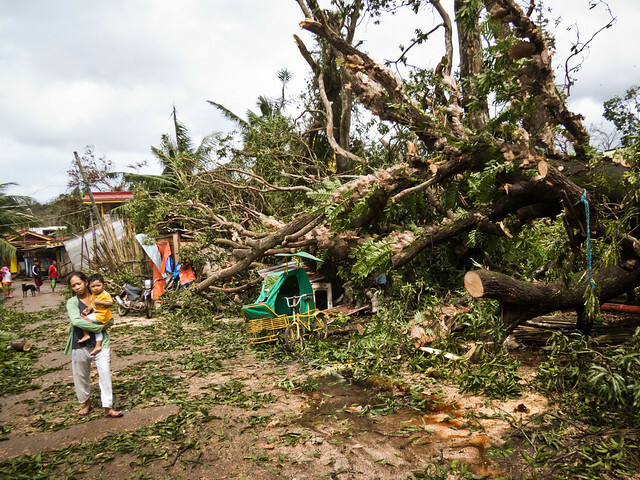 We heard stories of around twenty deaths, a number that pales in comparison to what happened in other parts of the Philippines, such as that of Tacloban where the storm was the strongest. The combination of a lessened force, the lack of a storm surge and a smaller population helped to keep the numbers low, fortunately. 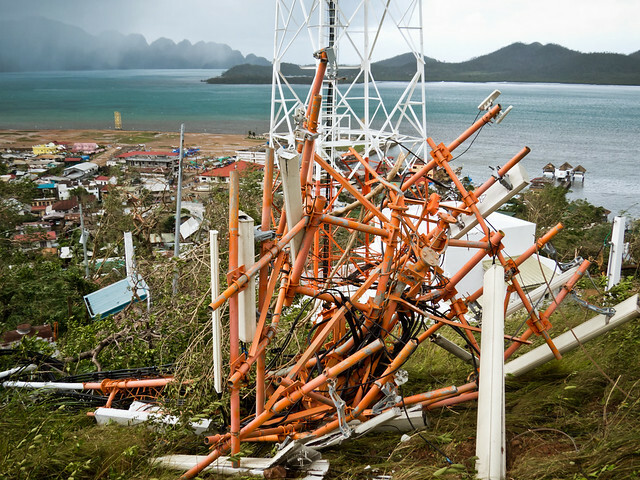 As a result of the communication towers being destroyed during the storm the far majority of both locals and tourists were left without phone or internet access. 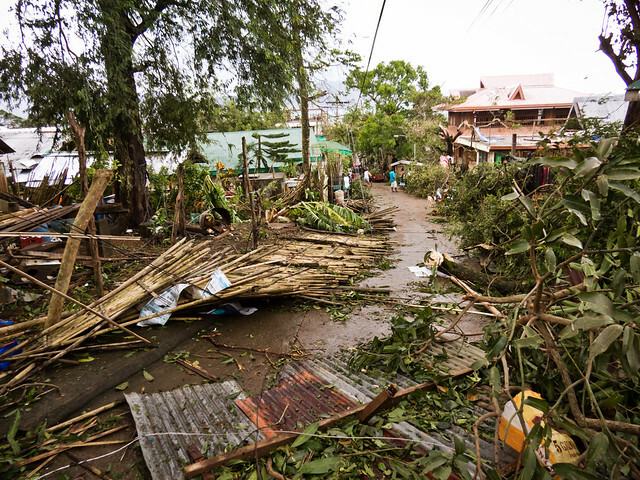 People were scrambling to make contact with family and friends on other affected islands as well as to notify people outside of the Philippines of their safety. Like us, locals borrowed phones and bought new SIM cards belonging to the much-less-used phone company with the single tower left still standing. With all of the downed trees and power lines everywhere, electricity was out and would likely be out for months. Some of the city’s water supply went dry and the rest was determined to be contaminated within two days of the storm. In addition, though we still seemed to have plenty of bottled water and food ourselves, we were informed that without the arrival of the weekly ship carrying resources for the townspeople, such as fuel, water and dry goods, we’d be left without a sufficient food supply in a day’s time. So, the island had no running water, electricity, phone, and internet access and was beginning to run low on food and water. The situation wasn’t great. 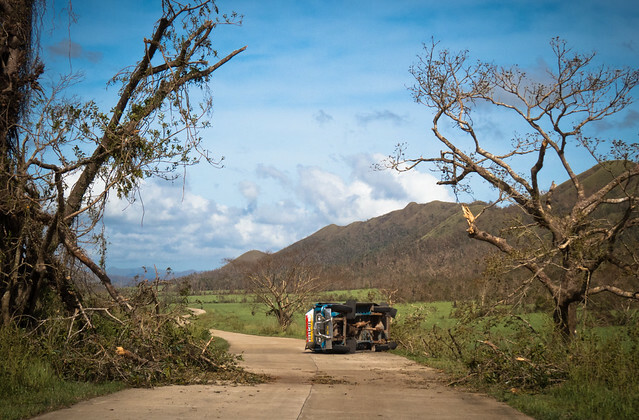 A priority of both the local and national government became the evacuation of both injured and pregnant locals as well as the hundreds of tourists who were still in Coron Town, unable to escape the storm’s destruction prior to its arrival. This would free up what resources were left for the locals. The problem in doing so was twofold. Firstly, the airport had been left in disarray. Though the landing strip was unaffected, both the radio control tower and airport building had experienced significant damage. Just like the town, the airport was without electricity and so had no runway lights; planes could land only during the day. Secondly, no small boat, ship nor ferry was coming to or going from Busuanga due to the fact that a new, smaller tropical storm was strengthening as it made its way towards the Philippines. Fortunately, with the assistance of the military the airport was again functional three days after the storm had passed. 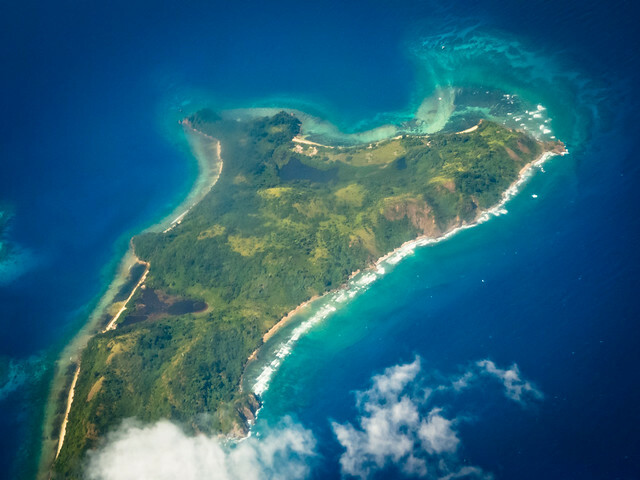 After waiting as standby passengers in the crowded airport for two more days, sitting on the floor amidst a mess of broken windows and tiny shards of glass, we finally made it onto a flight off the island. When we landed in Manila the entire plane broke out into celebratory cheers and applause. We were all ecstatic to have arrived safely in Manila and, more importantly, to finally be off of Busuanga after almost a week of being stranded. While we did not bask in the turquoise waters of Coron nor experience the underwater world of the sunken WWII ships as we had intended, we did get the opportunity to witness the inspiration of the Filipinos, some of the most resilient people even in the wake of the world’s strongest super typhoon. We’ll have to one day return to see how the island bounces back. Other parts of the Philippines weren’t as lucky as Busuanga. The death total across the country has exceeded 5000, not including over 1000 unidentified bodies. Families have been ripped apart. Homes have been lost. 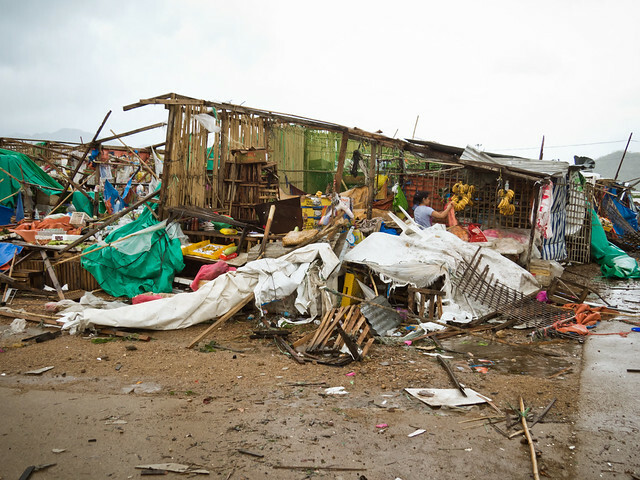 Many towns and islands, like Tacloban and Malapasuca, still lay in complete ruin. 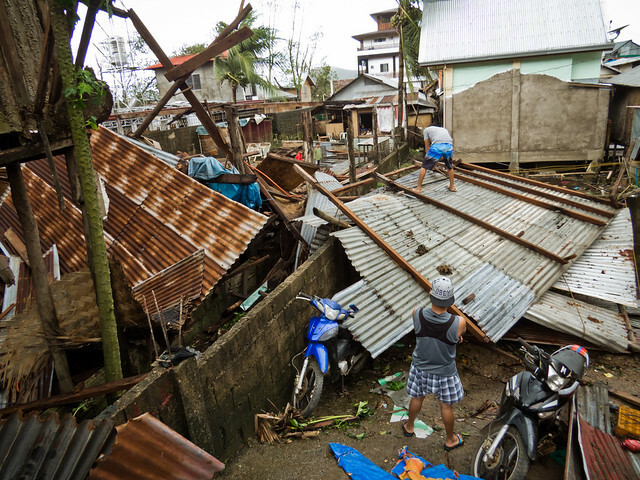 If you’d like to donate to Haiyan relief efforts please visit this CNN article to learn how you can help.